What is the secret of prayer beads and why are they used? In the history of mankind, prayer beads lined up on strings have been used to count prayers, to bring good luck in the hunting first, as amulets in battles, as amulets to protect from the disease in peace and as talisman also used with the intention of amulets. When it comes to the history of the beads, if we think of beads as lined beads, it is not hard to say that history is based on very old ones. There is no shape difference between the necklace and the bead used as the ornament. It is even possible to state that the prayer beads may have been inspired from the shape of the necklaces. When we look at the prayer beads during the past history of humanity, usage in India can be regarded as the beginning. In India, prayer beads have been started to be used from the BC 2500's and in Sanskrit, they have been known as "japa-mala", in which "japa" meant "prayer" or "repeated prayer", and "mala" meant "wreth of roses" or " wreath consisting of whispering strings". It was mostly made from seeds and transported by hanging on the neck. In Hinduism, the number of beads was 108 which corresponded to the number of Brahman's names. Same number of beads were also used in religions such as Sikh and Buddhism born in India later. As Buddhism spreads out to Asia, the use of prayer beads also spreaded to Central Asia, China, Hindu China and Japan, where the number of beads divided into 44 and 27 which are the dividends of 108. In China, sometimes the they have been called as "shu zhu" or "counting beads". In parallel, material diversification has begun and on top of seeds, semi-precious stones, trees, amber and bones were used. The Buddhists called prayer beads as "Om Mani Padme Hum" and "Jewellery of Lotus’s Heart" which is considered as the Buddha's true words. During the ancient civilizations such as Hittite, Urartu, Phoenician, Roman and Byzantine period, prayer beads were made from ceramics and glass bead necklaces. It is generally agreed by the researchers that the use of prayer beads in Christianity comes from Middle Eastern churches. The general acceptance of the use of prayer beads towards the Balkans and the Mediterranean via Europe is through this route. First use of the prayer beads started with the Christians in the 3rd century who are called the "desert parents". The prayer beads were consisting a string with 150 nodes on it and were used to perform 150 repetitions per day. In Orthodox churches, the prayer beads consist strings with 33, 50 and 100 nodes. There are numbers of node or knot variations in the prayer beads used In the Catholic Church. One used more often is with 50 nodes which has been associated with St. Dominic seeing the Holy Mother in 13th Century. In Catholic faith, "Rosary" is also associated with mandatory readings of 150 pieces from Bible. As in all religions, tasbih prayer beads were used for worship in Islam. In Arabic "sebh" is the plural "tesbihat" of the word "tesbih" from the root, which means the way to Allah. Prayer beads or Tasbih, which is used in many religions as means of prayers only, is also a beautiful art in Turkish culture. Enriching with culture and history, Turkish artisans have presented a beautiful, unique and tasteful art style to prayer beads tradition. In the early days of Islam, date and olive seeds, pebbles and knotted strings were used for prayer beads. After the third and fourth centuries of Islam, prayer beads known as "turbot" were produced by rolling and piercing the muds of sacred places such as Kerbela, Jerusalem and Kaaba. In addition to 33 and 99 beads, there have been also 500 and 1000 beads which were used for wishes and prayers. It is known that the most beautiful prayer beads of the world were made in Istanbul. These prayer beads were sent to sultans, collectioners and prayer bead passionates from Istanbul. 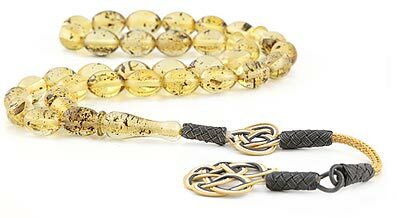 Turkish prayer beads have been particularly sought in Middle East Region, including Iraq, Lebanon, Jordan and other Arabic countries to be utilized as favorible gifts with great popularity. When it comes to the type of tesbih most commonly used in the Ottoman period, these are walnut, fish teeth, amber and tree origin.